A top of the table clash in the Suffolk Women's Division is the featured match on the Supporting Women's Football Blog with 3rd placed Copleston Ladies hosting leaders Brantham Athletic Ladies. The Suffolk Women's Division is one of the smallest in terms of number of teams competing as any in East, just the 7 sides in one division. That being said women's football in Suffolk is as strong as anywhere in terms of sides competing in the higher divisions. Out of the 7 sides contesting the Women's Division, Copleston Ladies and Brantham Athletic Ladies were amongst the pre season title favourites. Have both started the season strongly along with East Bergholt United who are looking strong too early on. 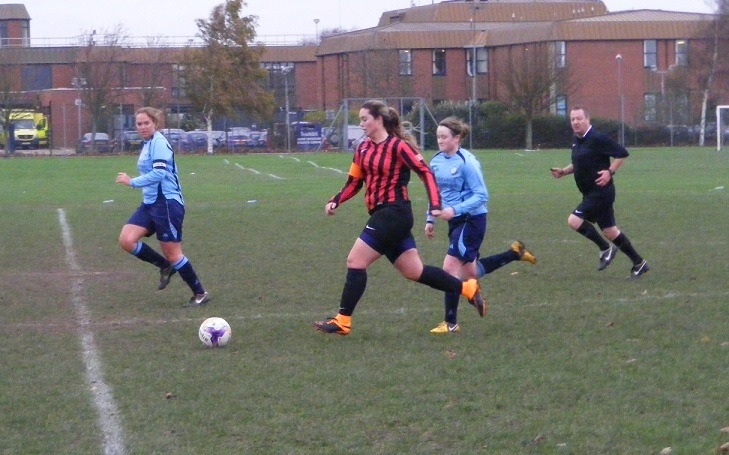 Copleston Ladies started the season superbly with 3 wins out of 3 to go top, have lost ground on the others above them simply because they haven't played a league game since the 11th of October with postponements and fixture scheduling. Play in Ipswich, Copleston in the north east of the town near the hospital, play their matches at the Copleston High School. Which is where I headed, I suspect I'm not the only one to do so as when you arrive at the closed, locked gates there is a sign with the sat nav directions to send you in through the right entrance to the playing fields. Brantham Athletic Ladies are top of the league having won 5 of their 6 league matches to date just the one defeat that to East Bergholt United who have an identical record to them going into today's match. Battled Long Melford Ladies all the way to the league title last season before falling short at the final hurdle will be hoping they can go one better this time around. A proper high school football pitch for today's match seen plenty of boots as much soil as grass on display through the middle, in pretty good shape otherwise, not looking overly wet despite the recent rain but a strong wind blowing across it would have helped dry it out. The wind would keep the clouds moving but would make playing conditions difficult for both sides as they warmed up on the pitch. Copleston Ladies starting XI - Daisy Hodgson, Megan Stock, Leanne Derbyshire, Anna James, Amy Trenter, Roxanne Middle, Hollie Akers (C), Elysia Young, Sophie Crane, Amelia Deuchars & Jade Horne. It's the visitors Brantham to kick off the 1st half wearing their away kit colours of red and black vertical striped shirts, black shorts and socks with Copleston lined up opposite wearing light blue shirts, navy shorts and socks. Brantham are attacking into the wind at the start of the match in the windy conditions both coaches are stressing the importance of not letting the ball bounce deal with it 1st time, Lucy Dunnett, Brantham's captain has the ball in the centre of midfield looks to play it forwards with strikers Danielle Harvey and Kirsten Hutchings ready to break beyond the Copleston defence. 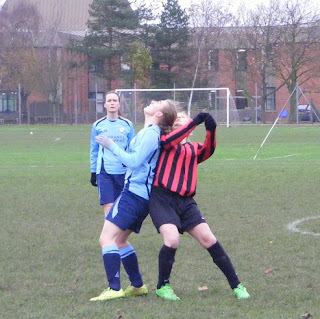 Anna James in the centre of the Copleston defence between the 2 Brantham strikers makes sure she gets a firm head on the ball halt the attack. Brantham win the ball back on the right the ball sent along the ground this time sends Hutchings clear right of the goal, has Amelia Deuchars on her shoulder the Copleston defender chases her into the box, does just enough to see Hutchings run the ball out of play before she can turn a shot towards goal. Copleston's Elysia Young travels with the ball up the left wing looks to play the through ball into the middle of the area for Jade Horne, with the wind being a factor causing the ball to stand up for Brantham at the other end this time it picks up pace and carries through to goalkeeper Keri Burley before Horne can get anywhere near it. 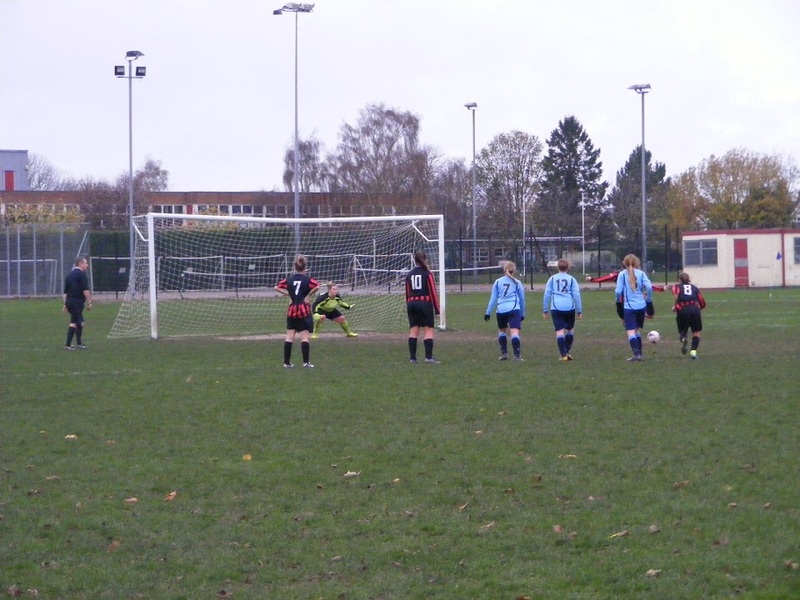 A good example of the windy conditions happens when Brantham win a free kick over on the right side of the field, Dunnett over the ball looks to loft it high into the box, instead it gets held up in the wind and is almost blown back to Dunnett's feet. Is end to end early on Copleston finding joy up the left of the pitch the final cross not finding their attackers s Brantham bring it out from the back and look to counter the pass into Dunnett in the centre and she immediately looks to send Hutchings through with the low through ball, Copleston goalkeeper Daisy Hodgson is quick to react races out of her area to meet the ball 1st kick it up the field. Copleston fail to deal with the bouncing ball at the ball as they drop off to defend with Dunnett rolling the ball out to Merlin Watson on the left, she plays the ball up into the air towards Harvey as it bounces across the defence 20 yards out Hutchings is the player who latches onto it skips into the box right of the goal pulls the trigger sends her shot wide across the face of goal. Good foot work from Horne on half way coming back down the right to help win the ball, get's it back shifts it inside before squaring the pass into Amy Trenter in the centre taking it forwards 5 yards lays the ball out to the left wing with Megan Stock racing up the pitch taking the ball to the byline wins her side a corner. Play is paused for a moment as a canine pitch invader sneaks on to give the home side an extra body inside the Brantham box. The corner from the left is swung in towards the near post, Brantham get it away. Dunnett is always looking to drive forwards, take players on when she gets the ball at her feet, looks to chip the ball over James in the Copleston defence, both race after the ball rolling into the left channel James getting there 1st to put it out for a throw. Watson links up with Harvey from the throw the ball sent into the Copleston box is too close to Hodgson as the keeper comes towards her near post to collect. Dunnett on the ball once more turns her marker and with the outside of her boot plays the pass forwards for Hutchings to break beyond the Copleston defence, James recovers quickly to try and get back on her as she breaks into the box right of goal Hodgson comes out to close down the angle as she shoots saves with her leg to turn the ball away from goal isn't clear Dunnett cathes up with play inside the box lays it out to the left for Harvey, she looks to shoot hit it hard from an acute angle, Copleston captain Hollie Akers has tracked back blocks the shot the ball flying wide across the box. Brantham win a corner kick taken on the left is put into the centre of the box, Copleston head it clear, the ball is picked up by Watson 25 yards out lays it into Dunnett in the middle, she shifts it between her feet before taking on the shot 20 yards out, doesn't get any pace n the ball as it comes in low, Hodgson gets herself behind the ball and drops forwards to make the save. GOAL! Brantham have a free kick on the halfway line Dunnett over the ball looks to play it long to the right of the box the target Hutchings letting it drop over her shoulder she is after the ball as it falls into the area, right corner Hodgson comes racing out and collides with Hutchings the referee points to the penalty spot. Dunnett to take the penalty for Brantham puts plenty behind the kick a powerful strike wrong footing the goalkeeper who dives to her right, Dunnett buries it in the opposite corner 0-1. Copleston haven't been able to get in behind the Brantham defence too often, the back four defending deep letting the midfield and attackers bring the ball forwards. The home side win another corner on the left with Akers playing the ball forwards into Sophie Crane in attack back to goal she sends the ball out to the left with Stock bursting up the wings again wins the corner kick. 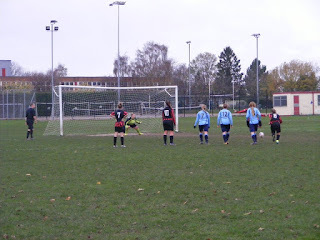 This one is delivered deeper into the middle, Dunnett is back to defend heads it back out to the left is retrieved by the corner kick taker, Roxanne Middle, looking to send it in to the box again hits the ball hard goes through the crowd Burley his her near post covered gathers the ball. Stock tries to put a ball through the Brantham centre backs to release Horne in the middle for a run and goal the wind taking it away from the striker. Young is presented with a chance to have a shot as Brantham lose possession, 30 yards out, gets plenty behind the shot the ball flashing across the box and wide of the goal. Winning a few more tackles in midfield Copleston are enjoying a good spell of possession as the 1st half draws to a close. Middle gets onto the ball on the left sends it up the right channel for Horne to chase, with no one available for the cross into the box she wins her side a corner kick. From the right Middle plays it in towards the near post Brantham defend sending it over the bar for another corner to be taken from the left. GOAL! Middle runs across the pitch to take the 2nd corner kick. The delivery is put into the same near post area six yards out plenty of bodies there, somehow the ball squeezes through all of them and falls favourably for Horne central to goal, hits the shot as hard as she can, the back of the net most definitely bulges 1-1. The goal has lifted Copleston's confidence, they press forwards putting pressure on the ball around the Brantham area are almost caught out late on when Jo Hazelton steals in to rob them of the ball in the middle brings it out the pass into Dunnett, her pass sends Hutchings clear off the Copleston defence who get caught defending a high line, has Harvey in the centre running up with her opts to shoot early sends the ball over the bar from the edge of the box. The honours even after a competitive 1st 45 minutes the wind is sadly playing it's part making conditions tricky for both sides, a committed battle going on in the middle of the park. Dunnett a treat whenever she has the ball at her feet has the pass in her locker to release the strikers in front of her. Copleston have battled hard haven't been able to get their strikers in on goal as much as Brantham however the scores are level as they kick off the second half. The wind has only grown stronger whipping across the open playing field. 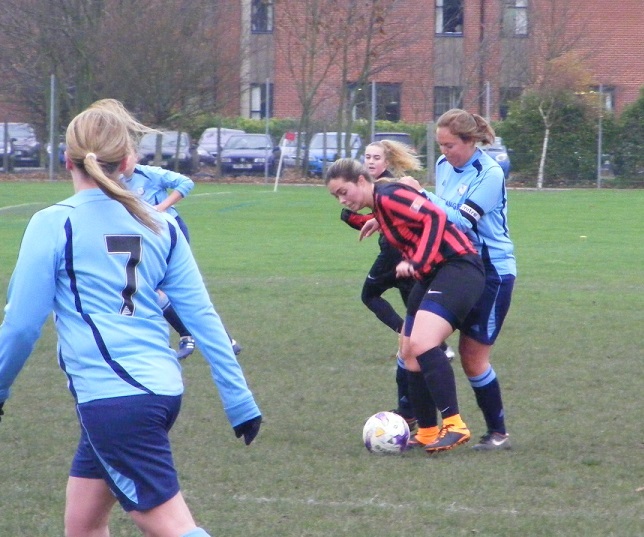 Copleston have made a change at the start of the 2nd half with Shannon Giles coming on for Sophie Crane in attack. Young and Trenter combine well in the middle for Copleston the latter opening up her body to send a great into Horne left of the D, no shot on has Stock making a run into a central position gives her the ball, slices her 1st time shot wide. Trenter taking the ball on again in the middle attempts to play it into the box with Giles breaking off her marker to race into space beyond, Burley rushes out of the six yard box to gather before Giles can reach the ball. From a throw halfway inside the Copleston half on the right, Elmes looks to play the ball over the top with Harvey making a run in behind Deuchars, the ball doesn't clear the Copleston defender who heads it out wide to the right is picked up by Dunnett 20 yards out goes for the shot hitting the ball hard the shot flashing across the six yard box. With the wind behind them 2nd half stronger than in the 1st half anything struck from distance by Brantham, might well cause a problem. The captain's both contesting the midfield have enjoyed a good battle all afternoon, (well perhaps not enjoyed). Stock charges down Hazelton at the back as she tries to bring the ball forwards, the ball ricochets, behind Hazelton as Stock runs past her, the two close in on the Brantham box, Burley has come reading the threat and clears the ball outside her box. A change for Brantham as they bring on Monique Peters for Watson. 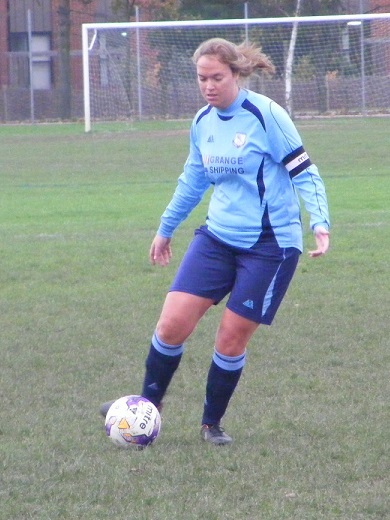 Dunnett on the ball drives out to the right side of the area before turning back inside and unleashing a shot from 25 yards out, wind assisted it flies straight into the gloves of Hodgson well placed in the centre of her goal. 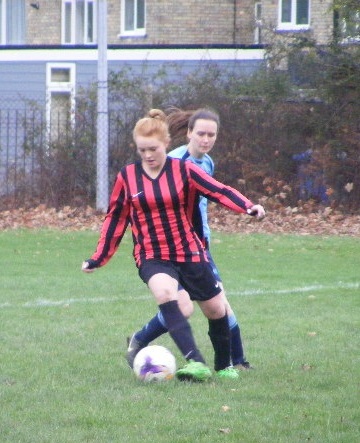 Copleston bring off Trenter, sending on Jade Carter. The visitors have a free kick 30 yards out right side having had a couple of tasters, Dunnett has a pop at goal plenty of pace behind the ball, won't come down in time to drop under the bar, over. GOAL! Brantham retake the lead, the wind has only gotten stronger the ball is played out from the back by Copleston out into the middle drops to the bright orange boots of Dunnett a yard in front front of the centre circle, she goes for the shot, send the ball in towards goal over Hodgson inside the box and into the back of the net 1-2. Deuchars is now up front to support Horne and Giles in attack for Copleston the ball is played high into them neither Horne nor Deuchars can bring the bouncing ball under control in front of the Brantham box, with Shanice Leek caught between them doing well to bring the ball into her body and dig out a clearance. Up the other end Elmes sends Dunnett through, evading two challenges she flashes a shot from the left of the box across the face of goal. Dunnett then turns provider sending Hutchings through into the box, riding a challenge herself stays on her feet, just runs away from her as Hodgson gets down to save at her feet. Copleston send crane back onto the field with Horne coming off. Brantham win a series of corners late on, taken from the left Copleston win the 1st ball but can't get it up the other end. One corner comes into the crowd gathered at the near post the ball drops amongst everyone is stabbed goal wards, Deuchars clears it off the line. Copleston break the ball put into the left channel, Giles goes after it as the defender tries to see it out for a corner, wont go, Giles wins it back whips her cross into the box along the byline doesn't evade Burley coming to her near post. Copleston press late on a throw the right the ball is swept into Deuchars inside the D, puts her foot through the shot Charlotte Partridge gets her body in the way to make the block the ball spinning out the the left, the cross comes back in Partridge takes a knock defending it, virtually the last action of the match as the referee blows for full time, very little light left and Brantham stay top of the league with the 2-1 win, move 6 clear of Copleston who lose for the 1st time in the league this season stay 3rd with 2 games in hand on the leaders. Been treated to some good football matches of late this one just as good competitive and committed from both sides, the wind definitely had a large roll to play very difficult for both sides to complete the passes they would have liked, would be good to see both sides again when the weather's calmer, and I might well do that as Brantham booked their place in the Suffolk Women's League Cup Final last Sunday. Copleston might have done too, the semi-final was played last Sunday finishing 2-2 after extra-time against Witnesham Wasps Ladies only it was too dark to take the penalty shoot-out the match was called off and they go again next Sunday with a slightly earlier kick-off 1:30pm. Brantham have another top of the table clash next Sunday as they take on East Bergholt United at home a 2pm KO. My thanks to both clubs managers for their help with the teams today will be watching the season closely to see how it all unfolds at the top.